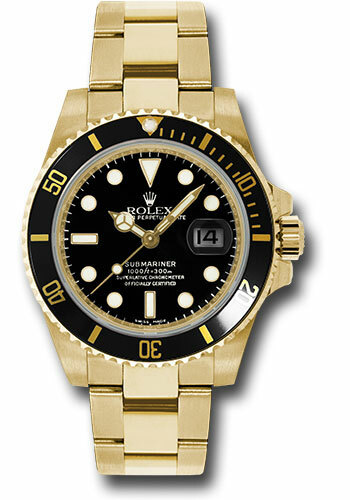 40mm 18K yellow gold case, black time lapse Cerachrom bezel, black dial, and Oyster Glidelock bracelet. Water resistant to 1000 feet. 40mm 18K white gold case, blue time lapse Cerachrom bezel, blue dial, and Oyster Glidelock bracelet. Water resistant to 1000 feet. 40mm 18K white gold case, screw-down back, end pieces and crown protector set with diamonds, screw-down crown with triplock triple waterproofness system, unidirectional rotating bezel set with sapphires and diamonds, scratch-resistant sapphire crystal with cyclops lens over the date, blue dial, Rolex calibre 3135 automatic movement with date at 3 o'clock, approximately 48 hours of power reserve, Oyster bracelet with flat three-piece links, Oysterlock folding safety buckle with Rolex glidelock extension system. Waterproof to 300 meters.